A pre-school is a wonderful place for Bob’s comedy magic show. No doubt your school is already full of creativity and colour, from potato-printed paintings to bright toys. With Magic Bob’s help, it will be transformed into a mini theatre show. Bob will bring the kind of fun and laughter children find irresistible. Popular in pre-schools all over the Midlands, Birmingham-based Bob’s packages last around 1 hour, and includes magic show, music and games. 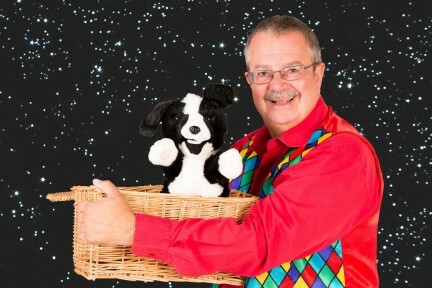 Suitable for young children between 3-4 years of age, Bob’s Pre-School Magic Show runs for approximately 35 minutes. This is the perfect time span for little-ones who rarely like to sit still! With Magic Bob, however, they are guaranteed to be enraptured the entire show. He will keep them regaled with the help of magical puppets, including Ben in the basket, Brian the Snail, Cheeky the Monkey and Scruff the Dog. Charmingly naughty, these characters are guaranteed to make even the shyest children join in. Children are guaranteed to be enthralled from beginning to end, right through to the finale, when Flopsy the magic rabbit makes an appearance. Magic Bob always encourages plenty of audience participation from children, which is great for their confidence. If you have a birthday child in the audience, Bob will ensure they are the star of the show. This includes receiving a personalised birthday card from the man himself. Like any entertainer, Bob is most available mid-afternoons and weekends. For pre-schools, you obviously need to book during the week, unless the show is a special event. To discover Bob’s availability simply contact him for more information. He is keen to accommodate your schedule and visit your pre-school whenever possible. Bob is both a CRB and DBS checked entertainer. For more information, please contact Magic Bob on 01527 546131 or 07800 905976. Alternatively, complete the contact form on the website.